Partido Manggagawa (PM): Workers to dare pols on wages & jobs issues with a march along Ayala Ave.
Workers to dare pols on wages & jobs issues with a march along Ayala Ave.
With more candidates declaring their intention to run for national office, the militant labor group Partido Manggagawa (PM) challenged politicians to spell out platforms addressing voters’ urgent concerns on the erosion of wages due to inflation and the generation of regular jobs. 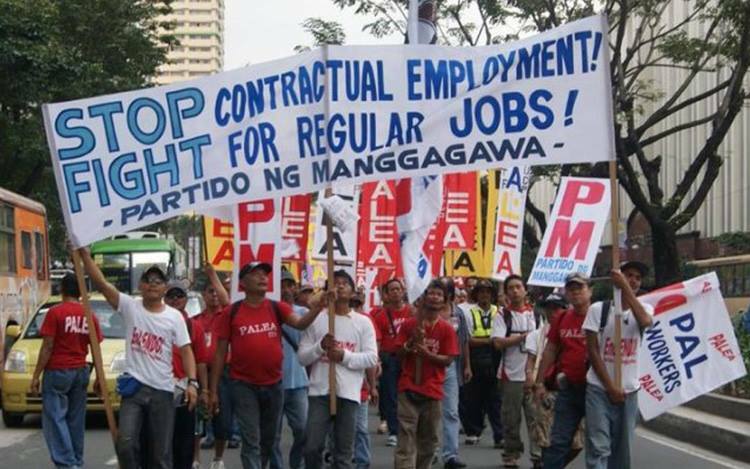 Several hundred workers from labor groups under the coalition Nagkaisa are marching tomorrow afternoon along Ayala Ave. to dramatize the call for job security and a living wage. “Everyday we see candidates declaring their intent to run but we hardly hear their platform for workers and the poor. Enough of motherhood statements and hollow slogans. We dare the national candidates to state what concrete steps they will do to resolve the problem of wages and jobs,” insist Rene Magtubo, PM chairperson. The march is also in observance of Global Decent Work Day, an annual event sponsored by the International Trade Union Confederation to highlight workers demands. Among those marching are contingents from PM and the union PALEA which has launched renewed protests as a result of another mass layoff at Philippine Airlines (PAL). “Concretely, we are asking candidates to make a stand on the security of tenure bill meant to regulate the abusive practice of contractualization. And also their commitment to raising salaries through a combination of wage hikes, basic goods discounts, tax exemptions and social security subsidies,” Magtubo clarified. The World Decent Work Day has a theme of “End Corporate Greed” for this year. The call for decent work is given a local flavour by a recent survey that reveals the most pressing issues of Filipino voters are inflation, wages and employment.